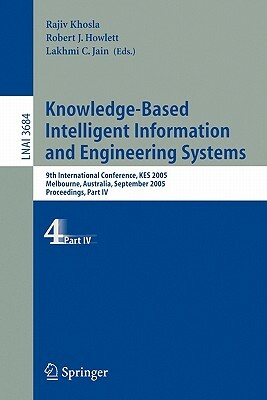 the refereed proceedings of the 9th International Conference on Knowledge-Based Intelligent Information and Engineering Systems, KES 2005, held in Melbourne, Australia in September 2005. The 716 revised papers presented were carefully reviewed and selected from nearly 1400 submissions. The papers present a wealth of original research results from the field of intelligent information processing in the broadest sense; topics covered in the fourth volume are innovations in intelligent systems and their applications, data mining and soft computing applications, skill acquisition and ubiquitous human computer interaction, soft computing and their applications, agent-based workflows, knowledge sharing and reuse, multi-media authentication and watermarking applications, knowledge and engineering techniques for spatio-temporal applications, intelligent data analysis and applications, creativitiy support environment and its social applications, collective intelligence, computational methods for intelligent neuro-fuzzy applications, evolutionary and self-organizing sensors, actuators and processing hardware, knowledge based systems for e-business and e-learning, multi-agent systems and evolutionary computing, ubiquitous pattern recognition, neural networks for data mining, and knowledge-based technology in crime matching, modelling and prediction.